The year of the Earth is divided into four seasons. There are four seasons in a year, which are summer, autumn, winter, and spring. The seasons cause significant changes in the weather and our environment. The summer is hot and the winter is cold. Leaves change their color to pale yellow in the autumn. Seasons also change the lifestyle of human and animals. For example, we cover our bodies with jackets and coats. While we used to wear thin fabric clothes in summer. Summer is hottest among the four seasons. In this seasons, the days are longer than the nights. When summer arrives in the southern hemisphere, then it is winter in the northern hemisphere. Many crops, like wheat, are harvested near the summer end. Autumn is the conversion period between the summer and the winter. This season arrives as the summer ends. In this season the temperature starts to drop until winter arrives. Leaves of the trees fall and change their color to pale yellow. Winter is the coldest season. It snows in many places during the winter. We change our lifestyle to live comfortably in winter. We try to insulate our bodies with coats to keep our bodies warm. Many people enjoy drinking coffee in the winter. The nights of the winter are longer than a day. Many animals migrate from one place to other to reach the warmer areas. 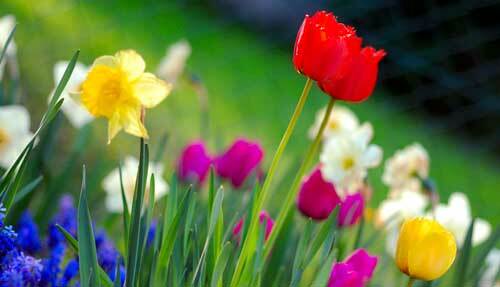 Much like autumn, spring is the conversion period between summer and winter. But, this time the temperature starts to increase in the spring. It is the very beautiful season among all other. It is sometimes called the season of regrowth. In this season, trees start to grow new leaves and seem to come to their lives again. 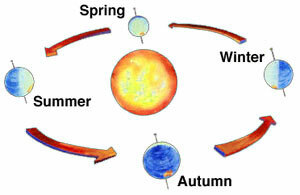 Seasons occur because of the tilt of the Earth’s axis. 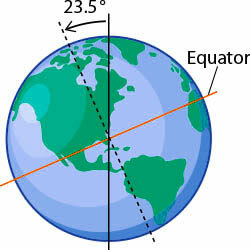 The axis of rotation of the Earth is not straight, but it is slightly tilted, which give rise to seasons. Our Earth completes one revolution in the orbit around the Sun in one year or 365 days. The sunlight that each part of the Earth receive, changes as the Earth moves in the orbit. This is because of tilt in the Earth axis of rotation. Due to this tilt, the Sun points northern hemisphere for half year and southern hemisphere for the second half year. As a result, the season of the Earth changes. The season of the northern hemisphere is opposite to that of the southern hemisphere. Plants lose their leaves in autumn in response to decreasing length of the day. Animals find the winter hard because it is difficult for them to find food. Plants produce fruits and vegetable in their seasons. Eating seasonal fruits and vegetable will make you healthy. Some trees remain green in all four seasons. These trees are called evergreen trees. Abdul Wahab, "Seasons," in Science4Fun, April 13, 2019, http://science4fun.info/seasons/.